Back when I started my undergrad degree at Mac, there was one really, REALLY annoying prerequisite for all students registered in a Biology program (didn't matter what program you were in, everyone took the same four courses in second year mixed with any other courses you wanted as electives to fill the gaps): Plant Biodiversity. UGH. I seriously HAVE to learn about plants?! You're kidding. Well, I guess all I have to do is pass. Preferably do more than pass, but that's a bare minimum. KILL ME if I have to do this a second time. Stupid plants. As you can see...I was pretty naive about the plant kingdom before this class started. Off I go to class on the first day, dreading that it's going to be just the. worst. thing. ever. In walks this medium-height older man, very pleasant-looking, kinda reminds me of that stereotypical grandfather image. Wearing a sweater-vest over a dress shirt, tie under his vest, glasses, balding on the top, hair that he has left is grey, carrying a leather briefcase built in 1964 (interestingly, the same year his car was built...but I'll save that for later). Dr. Lott introduced himself, and then promptly walked out the back door onto the loading dock. Huh? Well...that was a quick class. None of us were quite sure what to do (the overhead projector was still on, of course, so it didn't look like we should leave...), so we just sat there looking at each other. He walks back into the room carrying the stalk of this GINORMOUS plant that he grew in his garden over the summer, wearing gloves, and waiving it around. He told us a bit about the plant, a little snapshot of what we would learn about in the course, without ever mentioning the name and then went back outside and put it down (where his wife was guarding it, as we later learned). Then he comes back into the room, still wearing gloves, and takes some petri dishes out of his briefcase. Takes the lid off of each of them, and offers them to the students in the front row (note to self: sit in the front row next class). He asks the guy sitting on the end in the 2nd row to go up to the board and tally the votes for left hand vs. right hand so the class can keep track of the voting (of course, guy in the second row IMMEDIATELY jumps out of his chair. There is no crossing Dr. Lott...he might give you the general reminder of your grandpa, but there's also this unmistakable "do not mess with this man" feeling as well). Dr. Lott then told the class that one petri dish of seeds (apparently they were seeds! See? Sit in the front row!) came from the gigantic plant he just showed us, while the other came from the grocery store. The question: which one would you eat? He went from student to student in the front row, who looked in each dish and chose either the one on the left or the one on the right. The vote: 18-2 for the seeds on the left. The verdict: 18 people would be dead. And that, friends, is why taxonomy and plant identification is important. You'd better believe I was hooked from that day forward. The second (and only other course he taught) course I took with Dr. Lott was when I was in fourth year and it was about plant cell ultrastructure, and we learned a whole lot about plant cell organelles, how they work, and what happens when things go wrong. The other cool thing we got to do (well, novelty factor at the time) was use different types of microscopes to document different levels of plant organization. I got to use a Transmission Electron Microscope (TEM) to photograph a dividing onion root tip cell, and a radish cell to photograph the Golgi apparatus. Then a Scanning Electron Microscope (SEM) to photograph a "textured plant organ" that we brought in from home. I chose the leaf of one of my begonia plants in my window in residence because it had a lot of surface hairs and an acorn cap I found on the ground on campus. After that we learned all about the organization of tissues in the plant, and we got to take a panel of pictures that would be representative of the plant section that we were given using a regular light microscope. My partner Christine and I were given a plant stem, so I had to photograph 6 different views at different magnifications to give a representative panel of what we were looking at and any unique features. Things like how the vascular system is arranged in the stem, an individual vascular bundle, unique or unusual cells we found while scanning around, etc. I still have all of these pictures framed and hanging on my wall at home, 8 years later. This course was a novelty to me because who still uses microscopes these days?! I mean...come on. The TEM and SEM were fun because they were multi-million dollar machines, but seriously?! A light microscope? Come on. No one uses those still to see anything except undergrads in first year biology labs. Pfft. Spoiler alert: 75% of the data obtained for my PhD has come from...a light microscope. If it wasn't for that course, I would have been totally, completely, hopelessly lost the first time my supervisor asked me to prepare a slide. One more story: Dr. Lott's car. One day during that plant cell ultrastructure course, Dr. Lott comes in looking somewhat visibly distraught. Someone in the class asked him what was wrong, and he said that the day had finally come to replace his car and he was not looking forward to it. We got him to talk a bit about his car; turns out it was a 1960-something (pretty sure it was a '64, but my memory might be playing tricks on me) Cadillac. Yep, that's one old car. A lovely car, but an old car. He decided that because Cadillac was so good to him for 40 years, he should buy another. So he went to his local Cadillac dealer to take a look at what they have. He decides on a car to test-drive, the guy at the dealership gets the demo car ready for him, and he drives it around the block a couple of times. Likes it. Buys it. Then gets told about all of the fancy features that come with the car...and that's where he starts to panic a bit. Something to keep in mind about Dr. Lott: he was so very old-school. When he taught, he used: a) posters, b) the chalk board, and c) overhead slides. When he had to submit his grades to the department, he typed them up on his electronic typewriter and gave them to the departmental secretary (who didn't have the heart to tell him that's not the kind of "typed grades" they meant). If he had to give a presentation at a conference, he had one of his students put together a powerpoint for him and teach him how to use the buttons. Why is this relevant? The guy at the dealership told him there were computers in his new car that would ensure it was running smoothly, and would send e-mails to his home if something needed checking by the service department (he was, I think, describing the OnStar system to him). A man who had essentially never touched a computer in his life now had MULTIPLE computers in his car. He was most concerned about how long he had to wait for Windows to boot. In class we (I use "we" loosely...I have no idea how computers in a car work, but other people in the room definitely did) explained to him that it wasn't a personal computer and that there was no waiting for Windows to boot before he could drive. I think he was relieved. A few weeks later we asked him how he liked his new car and he went on for almost half the class about how much he loved it. He was happy, and I guess that's all that mattered in the end! So this blog is about plants...right. That very first plant that I learned about in Biology 2D03 "Plant Biodiversity" at McMaster University? 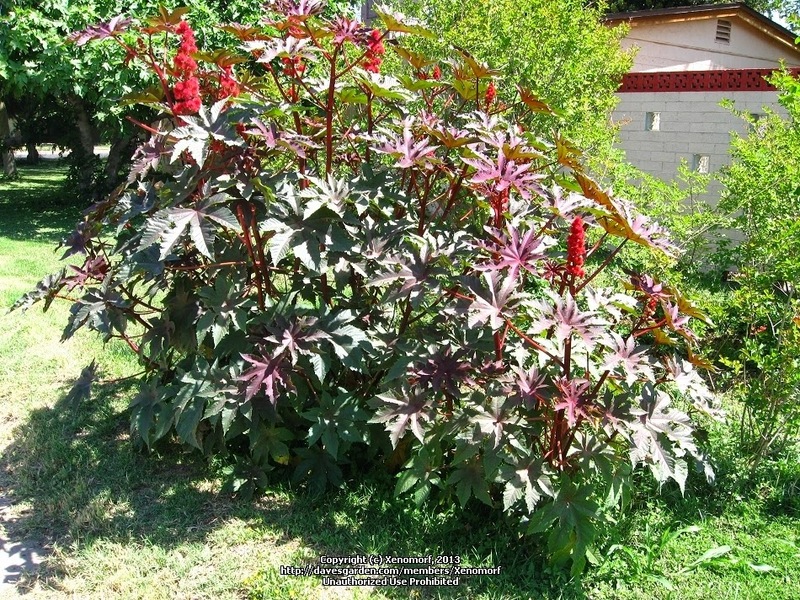 The castor bean plant. I learned that not everything should be touched before you know what it is ("look with your eyes, not your hands! "), that plants can kill you if you're not careful, that many of our medicines come from plants, and that plant identification is an important skill. What I didn't realize until much later was that this plant was near and dear to Dr. Lott's heart because that was where he spent a major portion of his career: examining the different elements and compounds present in castor bean seeds. He grew some of his "experimental populations" for seeds in his back yard, looking at how different varieties reacted under different growing conditions. Castor bean plants have, since then, always held a special place in my heart and brain. So I present, in memory of Dr. Lott: a blog about the castor bean plant. The castor bean plant isn't a bean at all. It's in the Euphorb or the spurge family, which explains the white, milky latex that exudes from wounds in the plant stem and leaves (nearly all members of this family do this; in fact, I can't think of a single plant in this family that doesn't but I'm sure they exist). In many species this latex is toxic, and this plant is no exception. 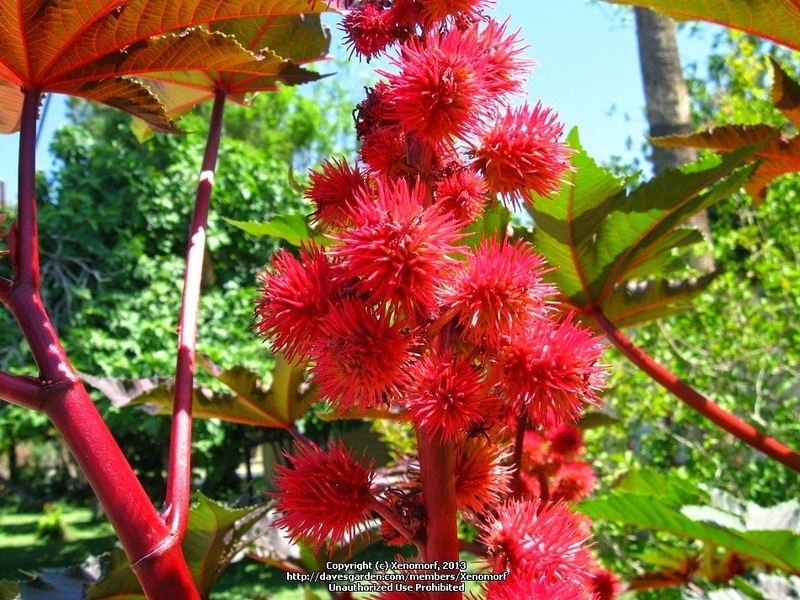 The castor bean plant is native to the Mediterranean basin in Europe and northern Africa, but is now widespread around the world as an ornamental species. In North America it does quite well, but our cold winters here in Ontario kill the plant during the winter. A bit further south, where the winter isn't as severe, this plant could set seed and the seeds would produce a new generation the next year. As you can imagine, this does pose a problem if it does get away, and may become invasive in some areas in the southern United States. 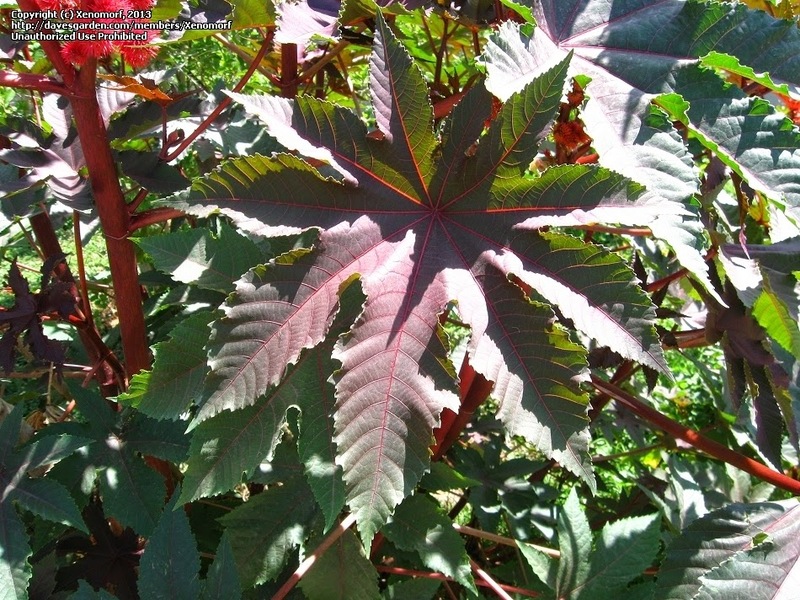 The castor bean plant is a "superplant" when it comes to the growth it is capable of within a single growing year. 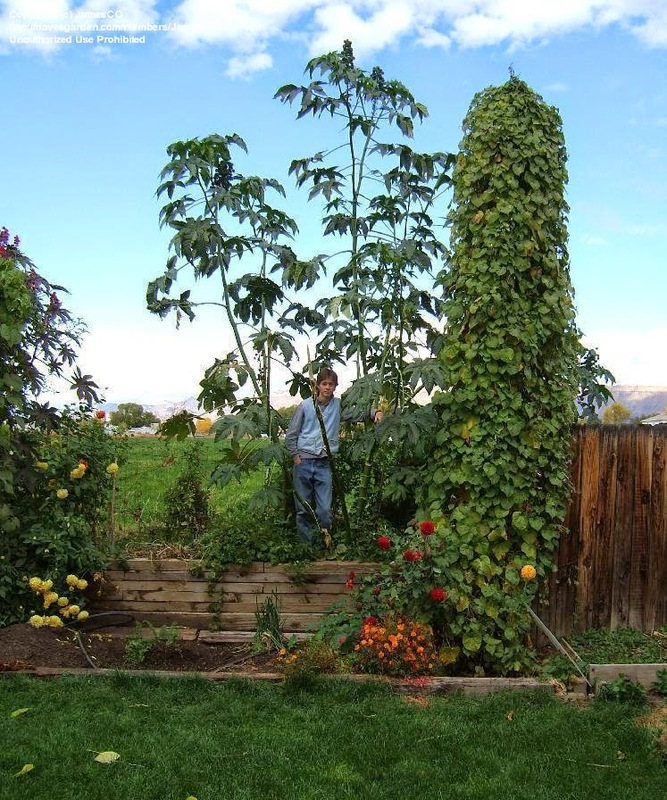 The plant in the fourth photograph above is of a full-grown adult male (the picture caption by the photographer says he's 5'10"), and a castor bean plant that was planted from seed in May of that year (the picture was taken on November 1st). A single growing season, and the plant is nearly three times his height. This isn't unusual, nor is it even remarkable as far as this species goes...that's a "day in the life of a castor bean plant". What is remarkable is that it can grow even taller than that under optimal conditions; as much as 39 feet in a single growing season. As yourself how many other plants you've ever seen grow THIRTY NINE FEET in only 7 months. That's insane. Insane! The lower leaves on this plant would be absolutely enormous, and if they didn't contain skin-irritating latex they would make excellent impromptu umbrellas if you ever get caught in the rain. No matter what anyone tells you, this plant is incredibly dangerous and should absolutely be respected should you ever come across it. In fact, in 2007 the Guinness Book of World Records named this plant the "Most Toxic Plant in the World". The latex produced from the plant itself is pretty benign, but if you have sensitive skin you will definitely want to cover up before coming into contact with the plant. Burning it is also not a good idea; the smoke can irritate the eyes and lungs, and in those with sensitivities can cause severe allergic reactions. There are neurotoxic compounds in the latex, but you would have to be exposed in great quantity in order for this to be a real health risk (farm workers harvesting this plant for oil in India and Brazil, the world's two largest growers of the castor bean plant, are at great risk). That in itself would be a good reason to keep kids away from it, but if that's not enough then here's one more reason: four measly seeds (each one about 1 cm across) is enough to kill an adult human. The seed coats are incredibly toxic, as is the layer of "bean" (the cotyledons of the plant, or the seed and storage leaves) directly under the seed coat. Peeling this off is not enough to completely get rid of these toxic chemicals; they are also present in the seed itself in lower concentrations. The toxin in this plant is probably the reason why the Latin name sounds so familiar to you, even if you've never come in contact with this plant before: this is where we get ricin. If seeds are consumed, the progression to death caused by ricin doesn't sound very pleasant: vomiting, bloody diarrhea, seizures, severe dehydration, confusion, delirium, extreme sweating, burning of the mouth and throat, severe abdominal pain, and a racing heartbeat. The symptoms don't start until about 36 hours after ingestion (except in very high concentrations of pure ricin extract, where the onset is 2-4 hours after ingestion), and can last up to ONE WEEK before death. A whole week! Don't mess with this plant. Seriously. All that being said, there is still some serious promise for this plant's use in medicine. Alcohol extracts from the leaves and seeds (a method of extraction that does not select for ricin) has shown promise in treating bacterial and fungal infections, protecting the liver against various toxins, as an antihistamine, an anti-asthmatic, and has anti-inflammatory properties. Not too shabby if you ask me! It also has shown some promise as an analgesic, but it's difficult to determine if the pain relief comes from the paralysis of the central nervous system that arises from poisoning from this plant, or if it's a stand-alone effect. Much, much more research is needed before we ever take capsules of castor bean extract! Castor oil is an important plant extract used in a huge variety of ways. It is a great lubricating oil, and has been used in combustion engines since the First World War. It is currently used in cosmetics, as a biodiesel fuel, and in its processed form in the chocolate industry as a substitute for cocoa butter (a use for this plant that will likely drastically increase over time with the ever-increasing cost of cocoa). 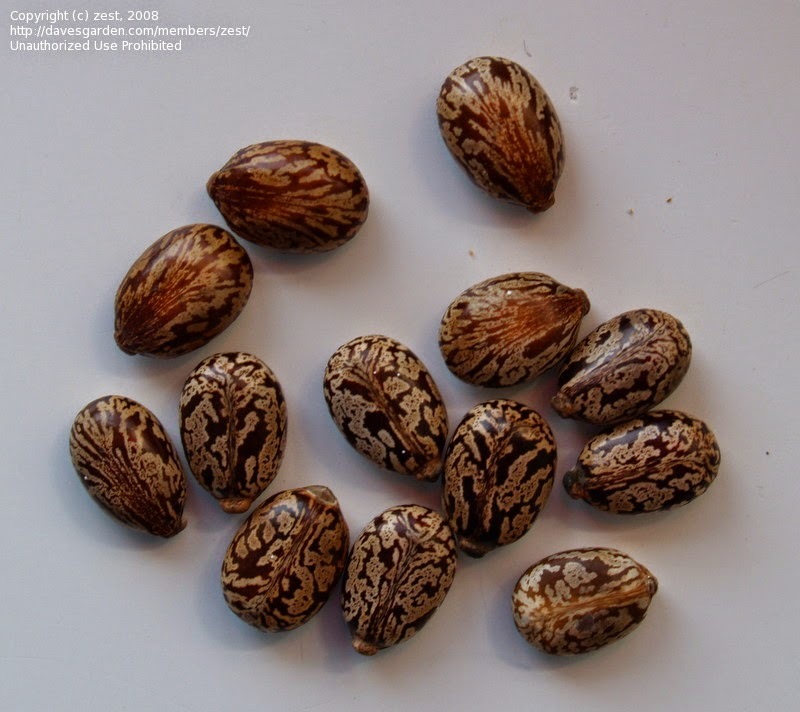 There are also many medicinal uses of castor oil, which no longer contains the ricin once present in the seeds (when the oil is heated to its boiling point, the ricin protein is denatured and is no longer toxic). It can be used as a laxative, showing that it is indeed still toxic to some extent or else your body wouldn't be trying so hard to get rid of it! There are some claims that rubbing castor oil on your skin can cure cancer, but this is a load of rubbish. It has never been shown to have any effect on tumor size in any kind of animal (or even cell line) study. Don't fall for this stuff! Moral of the story: castor bean plants might look pretty (their seed pods are pretty spectacular! ), but they can be very, very dangerous plants. Be careful with them if you grow them! "Students had a special place in John’s attitude to the responsibility of teaching – and mentoring – and drawing out the best a student had to offer – which he achieved by his patient and warm encouragement and by the implicit understanding John showed, that students were not different – only younger and a little less experienced." Thanks for the memories, Dr. Lott. You have helped create who I am today and showed me that those "boring green things" not only had value in my life, but were actually incredibly cool. Your philosophy towards teaching is something I have adopted in my own teaching style, and now every time I look up at my TEM photographs of my root cell in mitosis, I'll have even more fond memories of my time in your classes.